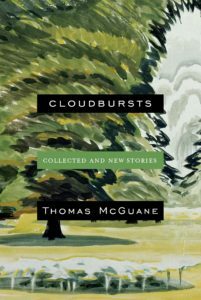 The short stories of Thomas McGuane can be summarized in the words of John Gay’s self-chosen epitaph: “Life is a jest, and all things shew it; / I thought so once, but now I know it.” Life may be a jest, but in Mr. McGuane’s collected stories, there is little laughter; and what mirth there is the laughter of sympathetic recognition of human folly. Preparing people for one thing and giving them another. That is the spirit of liquid modernity, permeating a world in which all too often the inhabitants find there’s no joy but in meanness. Business partners are betrayers and embezzlers. Good Samaritans are artful con men. Spouses are faithless. The few friends who turn out to be kind and reliable are stumbled upon by accident. And children are left to puzzle out the modern age on their own, without a reliable North Star in the guise of parents, teachers, faith, or tradition. Each tale is presented with an urgency that is sometimes breathtaking, and then it ends like a cloudburst: intense while it lasts, but then suddenly over. When I first met him, he had paid for some genealogical research that revealed an Indian ancestor, very remote, a granduncle or some such, but it left him entirely preoccupied with ‘coming to grips with my Native American heritage.’ He was still burning herbal wisps when I first appeared to help him revive his sailing dream, but he gave it up soon after. He was hard of hearing, and you had to face him to talk; he’d tried a hearing aid a while back, an advanced one that eliminated background noise with cutting-edge directional features to capture what was important. But when he went to catch a bebop quartet at a San Francisco jazz club, the device homed in on the drums, leaving Miles momentarily traumatized. At first he blamed the whole thing on bad dope, but in the end he forswore the technology and resumed his head-tilted lipreading. “God wants me to trust the ears he gave me,” said Miles, the confirmed atheist. Uncle Paul began to wail at the end of the table. It was astonishing. He looked around at his family and sobbed, not bowing or covering his head and face. A theory about traditional keening may have lain behind this, perhaps giving it a somewhat academic tone that didn’t make it any less alarming. “What’s the matter, Paul?” my mother asked softly, which only raised the volume. I’d never seen anything like this before. I was thrilled at this splendid racket. Uncle Walter stood and placed his hands on Paul’s heaving shoulders, giving them rhythmic squeezes, as the campaign medals tinkled. That seemed to calm Uncle Paul somewhat. Aunt Dorothy had begun a contrapuntal snivel, and Walter gently raised his palm for it to stop. Constance ran to the table with a glass of water, taking that position that Paul had something stuck in his throat. My mother held her cheeks, which streamed hot tears. Dorothy lowered the window, then the shade, and turned the Sunbeam fan up several notches until napkins began to flutter. Paul struggled to his feet, and Walter steered him slowly to the door as though fearing Paul would buckle. My father jumped up and threw out an arm in Paul’s direction with startling emphasis, a mariner spotting land. “For Christ’s sake, tell him to pull himself together!” He was nearly shouting. There was something experimental in his exasperated tone. Walter stopped, his back to us and his head bowed. He turned slowly, his head still bent, but when he faced our way, I saw his eyes blazed. “You would do well,” he said to my father levelly, “to mind your own business.” A terrible quiet followed. Here as elsewhere in his stories, Mr. McGuane expresses as much by what he says as by what he leaves unsaid. There are stories in this collection that are dark gems. In “The Casserole” a seemingly tolerable marriage ends with startling suddenness. Another story, “Canyon Ferry,” is as fine a story as any written today, telling the sad saga of a marriage and family destroyed by that casual evil, that acedia, that is today often brushed off with the words, “That’s just the way everybody lives.” Cloudbursts is the work of a master of his craft. James E. Person Jr. is a longtime reviewer. He is the editor of Imaginative Conservatism: The Letters of Russell Kirk(University Press of Kentucky, 2018).